Previously, i have written an elaborate post for how to insert Search Engine Optimization Code - SEO for your Blogger Blog. I had also provided a full detailed code, along with other additional details of how to fill up your details into the SEO Code. As a continuity, in this post, I will elaborate how to get your Facebook App id and Facebook Admin Id for Blogger. This method will also work for WP users i believe, as I'm not a WP user, I'm not much aware of it. Lets get started...! Facebook App Id : A unique number to identify your app to which you need to integrate Facebook's audience network ( Facebook ads ). This can be useful if you run Facebook ads in your mobile app. Step 1: Log into your Facebook, go to your page, and click on the about tab. 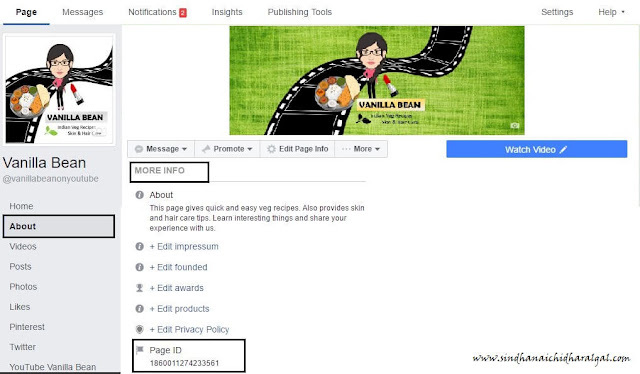 Step 4: Now you can see a success message along with the Facebook profile id. Step 5: In case you get an error, this means you have restricted your privacy settings. Step 6: To overcome this, go to your Facebook profile -> Settings -> Privacy , and click "Do you want search engine outside of Facebook to link to your profile" to Yes temporarily. Once you have all finished up, you can turn this back to No. Step 7: Now repeat Steps 1 to 4. Step 3: The steps involve 2 parts. Firstly you need to register yourself as a Facebook developer, Next you need to create an app id for your website. So with this the first part of registering yourself as a Facebook developer is done. Step 4: Now we need to register your website to create an app id. The below page appears automatically once you have registered yourself as a Facebook developer. Click on WWW. Step 7: Now your app id is created. For further customization of the mobile apps and ads you can follow the following steps. Since I'm not using any mobile apps and ads, I'm yet to explore this area. Also i heard Facebook ads pay you in peanuts compared to ad sense. If not just skip this step.
! You can add your Facebook profile id instead of your Facebook app id in the SEO code if you don't have a mobile app or not interested in using apps in future. Hi Sindha, thanks for the tutorial. I followed the instructions and it worked for me. November 17, 2017 5:14 pm delete This comment has been removed by the author.